Alexander McQueen said that you’ve got to know the rules in order to break them and I couldn’t agree more. One of our industry’s longest-standing ‘rules’ has always been the fashion calendar. Just as night follows day, AW follows SS and the twice yearly launch of two season-focussed collections has trained designers and shoppers to design and buy on auto-pilot, brainwashed by convention and disconnected from our daily lives or needs, not to mention the weather! As we can see from the prolific discounting and waste that results, this formula has become obsolete. Customers don’t shop like that anymore. I’m an artist and have never followed convention for the sake of it. In fact, I actively defy it where I can, which is usually how I create, design and discover. I also don’t like waste. I see no point in over-producing. I’m not alone in believing that sustainability isn’t a choice we should be making but a necessity. It’s common sense, right? As far as designing is concerned, I design intuitively. I don’t follow trend reports and I don’t observe the fashion calendar. For me, fashion is about style and not trends. Two different people will style the same scarf with a completely different attitude and I love that. 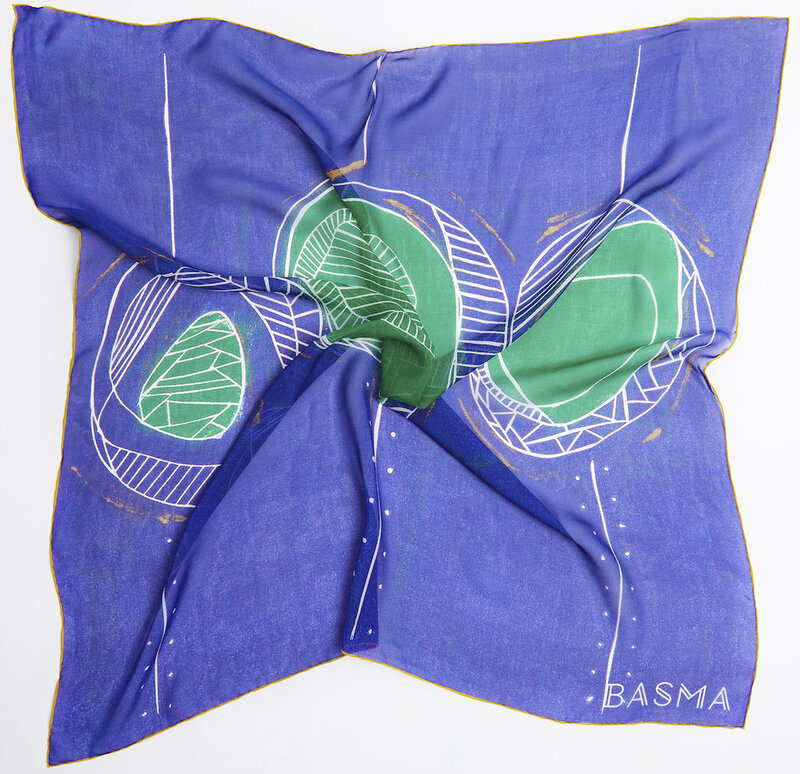 Basma Design seeks to reinterpret the silk scarf just as you reinterpret the clothes you buy and for me individuality is one of the most precious gifts which my scarves can communicate. As an artist, I draw ideas from everyone and everything but Azzedine Alaïa , who died earlier this year, has always been one of my strongest inspirations. He has always beat to the sound of his own drum. Light years before the See Now Buy Now concept was established at London Fashion Week (in which collections become available immediately after the show), he abandoned the show schedule, refusing to the industry’s expectations and indeed passing trends. After a period of showing his collections months after the traditional fashion week schedule, Alaïa retired from the show calendar entirely in 1992. Back at Basma Design, I launched two new styles last month, mid-season and for no reason other than the fact they were ready after months of experimenting with abstract ideas and new concepts. Collection No 9 comprises two classic square styles and one slim, rectangle shape. For all three styles, I’ve interpreted nature through an abstract eye, transforming the natural and abstract into wearable art. I am still working on one of the styles, which will be released in the New Year, but you can see the electric Lapis Lazuli and the fiery Rose Crush on the website now. I’d love to know what you think. I’m still drawn to linear forms and architectural design but have embraced the natural beauty of trees and flora to produce two radical, refreshing and empowering styles. The act of giving at Christmas was traditionally about craftsmanship and finding unique gifts for an individual, so I can’t think of a more meaningful present than a luxury silk scarf designed and printed with love in England. 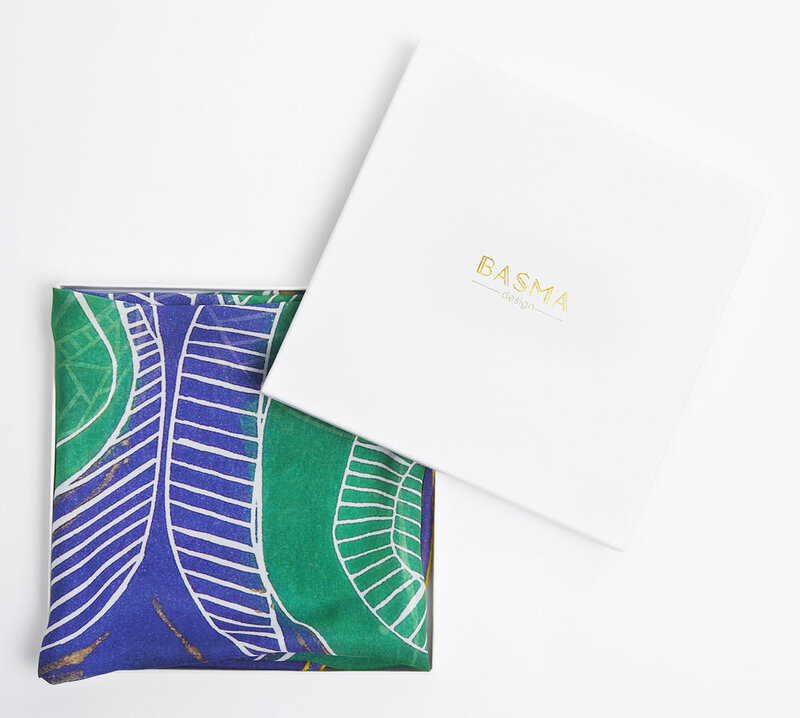 There is no one quite like you and there are no two Basma Design scarves which are entirely the same. Sign up to our mailing list to learn about new releases and to receive your exclusive gift voucher towards your first purchase. Once my scarves are gone their gone, so you’ll want to see them first.